The Music System is an ingenious hardware and software solution capable of generating three music voices using a very low cost circuit board. The board provided with the Music System is the small tan board in the picture below (not the green board beneath it). The system utilizes the INTE (interrupt enable) line on the S-100 bus – which can be toggled under software control – as a crude pulse width modulator. Requiring just three passive components, the circuit board provides a single pole audio filter and a DC block capacitor. The Music System was distributed by Software Technology (a division of Processor Technology). 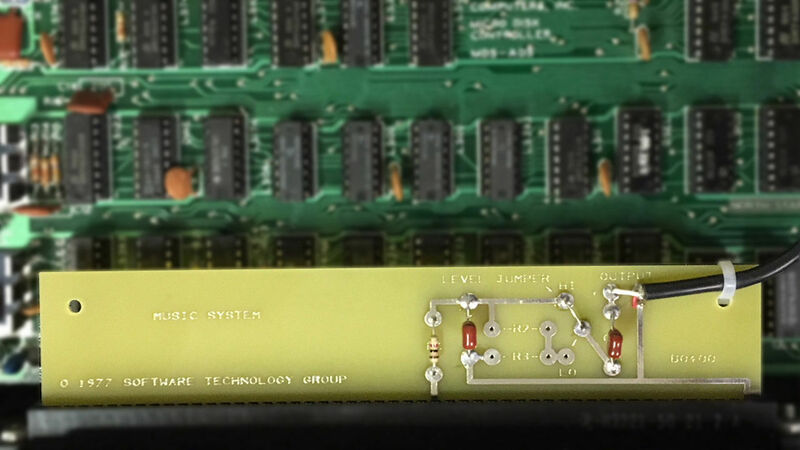 Designed primarily for Processor Technology's Sol-20 computer or for systems running their "Sub-System B," the board can also be used in other S-100 machines by providing a monitor ROM that provides the same console I/O entry points as their SOLOS or CUTER monitor ROMs (see the demonstration video below). The board pictured above and demonstrated in the video was recreated by Martin Eberhard from artwork in the Music System manual. Martin has made these boards available for sale along with a Sol-20 compatible cassette tape of the original music provided with the Music System (plus a number of additional songs). The board you'll receive is bare – the parts and cable shown in the picture are not included. To order a Music System board and cassette tape, contact Martin by email at mfeberhard followed by ASCII 0x40 followed by the Google email domain. deramp5113 followed by ASCII 0x40 followed by the Yahoo domain name.